E.15 What is hot fix rhinestone?heat press rhinestone?heat fixed rhinestone? 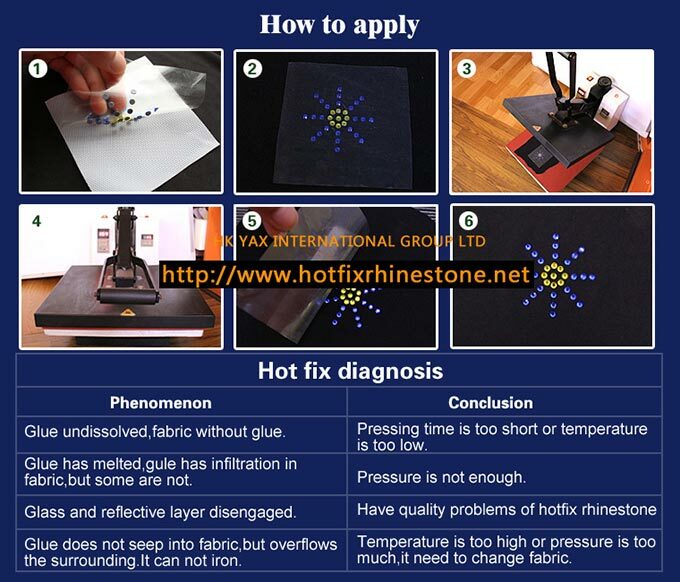 Hot fix rhinestone is a small accessory which cut by artificial crystal, with hot melt glue bottom. Hot fix rhinestone consists of cut facets,reflective coating,paint and hot melt glue. The factory of garment/shoes/hats will iron rhinestones motif on the fabric after they get the hot fix transfer motif designs which finished layout already .The rhinestones glue will melt and then back to solidified by the way of heat transfer/iron on, so that the crystal can be stick on the fabric or leather. The process of adhesion is depend on heat transfer machine mainly. The function of heat transfer machine are heating and pressing. The process of layout is fixing the rhinestones on the hot fix tape according to your design. May other call:hotfix cristal,hotfix strass,hotfix pedreria,hotfix crystal.or transfer cristal,transfer strass,transfer pedreria,transfer crystal. 2018.1.1-31,---- Brand hotfix rhinestone Swainstone 60% Discount!. Swainstone advantages : no lead (Pb), no cadmium (Cd) ,no nickel (Ni); 14~16 cut facets, it is very sparkly crystal with super strong glue and silver plated bottom. Enjoy the discount when your order amount up to 2018USD!